A Very Simple, Healthy, and Delicious Stew | Robert Mitchell Jr. When you start looking into low-carb and/or slow-carb diets you find out that it’s the old standby vegetables and starches from the days before mono-cultural, factory farming took over that are the best for your health and waistline. Time was when people ate turnips instead of potatoes and parsnips instead of carrots. Both have more fiber and nutrients than their more popular parallels. Here’s a tasty stew that contains both. Cook Lima beans on the stove by the package directions. Brown the beef in a skillet. Throw everything in the crock pot. Add beef stock until the ingredients are not quite covered, The mix will cook down, the veggies will give off moisture, and by the time the stew is done the liquid level will come up about an inch. But don’t worry — if you add a little too much broth it won’t be ruined. It’ll just be soup instead of stew. Cook on low for 6 hours. 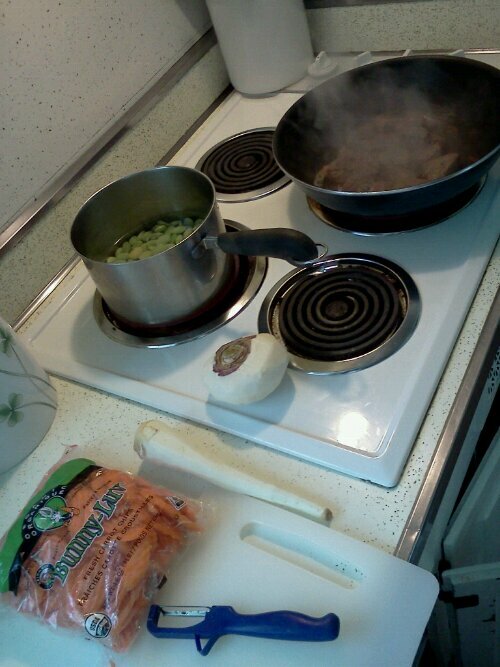 This entry was posted in Green, Martial arts and tagged recipe, stew. Bookmark the permalink.